Hotels Not the Best Place for Art? 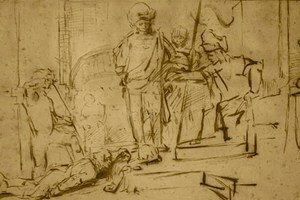 As a wise Museum Security Director once said, ‘It’s a hotel, why should we expect them to safeguard their art?’ On Saturday this Rembrandt sketch was stolen from the Ritz-Carlton Hotel in Marina del Rey, but has since been recovered near a church in Encino. the small drawing was removed from the exhibit Saturday night when the curator was distracted and the drawing was quickly stolen. This almost seems like a case where the work was poorly secured, and anyone could have walked up and stolen it. But there have bee other more elaborate thefts of Rembrandt’s works. For more on why Rembrandt is such a popular artist to steal, have a look at Anthony Amore and Tom Mashberg’s new Stealing Rembrandts: The Untold Stories of Notorious Art Heists . Rembrandt painting stolen from Marina del Rey art exhibit, officials say – latimes.com, (2011), http://latimesblogs.latimes.com/lanow/2011/08/rembrandt-stolen-from-marina-del-rey-art-exhibit-.html (last visited Aug 16, 2011). Stolen Rembrandt recovered at church – latimes.com, (2011), http://latimesblogs.latimes.com/lanow/2011/08/rembrandt-stolen-church.html (last visited Aug 16, 2011).